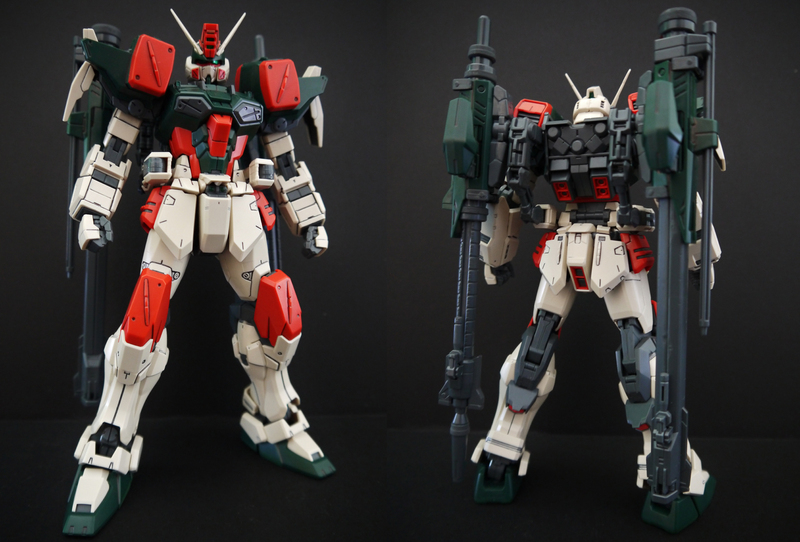 Of all the remastered G Machine designs, I gotta say Buster is the most significant and most aesthetically pleasing in MG form, even more-so than the Aegis. I really have to hand it to Bandai for their new take on the Buster; they really succeeded in giving it a heavy duty artillery suit feel. Almost military-esque. The huge amount of detail, giant cannons, color scheme, everything is just gorgeous. It’s just too beautiful. The entire suit has a very stable, strong stance. It was never particularly impressive in the anime series, but the redesign really does it justice. Like all the other new MG Seed units, Buster is exceptionally well articulated and extremely stable, thanks in no small part to its new X-Frame. Opening cockpit only opens at the lower hinge, as opposed to having the orange piece split in two and open upwards and downwards as it does in the show. The cannons mounted on the backpack are on very articulate hinge arms that can swivel forward and plug into the hands with little to no problem. There are two handles on each cannon, and are using accordingly to which configuration you have the guns in. I believe the one on the right is an anti-armor shotgun and the one on the left is a long-range sniper cannon of some sort. Can’t remember their exact specifications. Small missile pods on the shoulders also open up; six orange missiles in each. They come molded correctly, unlike the original 1/100 kit, so no painting needed. Very simple gimmick, and gets the job done nicely. No fancy hatch opening or anything, and it looks really nice. Once again, articulation just blows my mind. 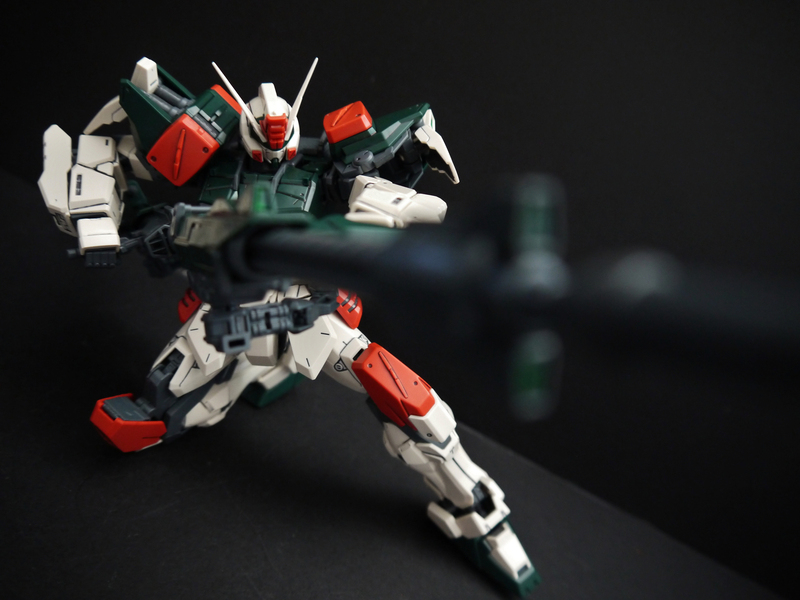 I love all the G Machine kits for how incredibly stable they are. 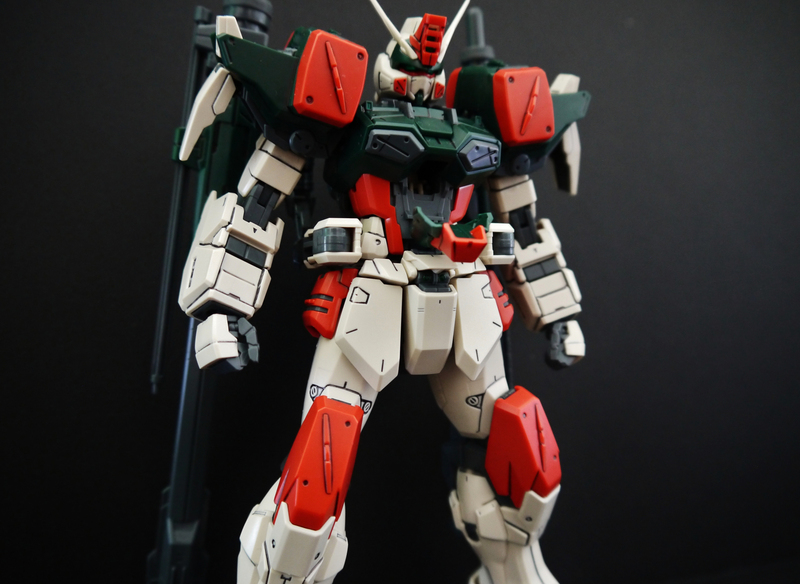 Weight and balancing are hardly issues unlike most kits, and the Buster is particularly impressive in its legs and ankles. Unlike the Blitz, the ankles could actually bend pretty far sideways, allowing it to maintain pretty wide stances. There’s some common misconception by those who don’t know the Buster that well that its knees also open up to reveal missile pods. Unfortunately, this isn’t the case, even on the original Buster in-series and in previous kits. It only ever had missiles on its shoulders, but given the similar design of the knees I can see how this may lead some astray. Plug one gun into the other and you’ll get one form or the other. 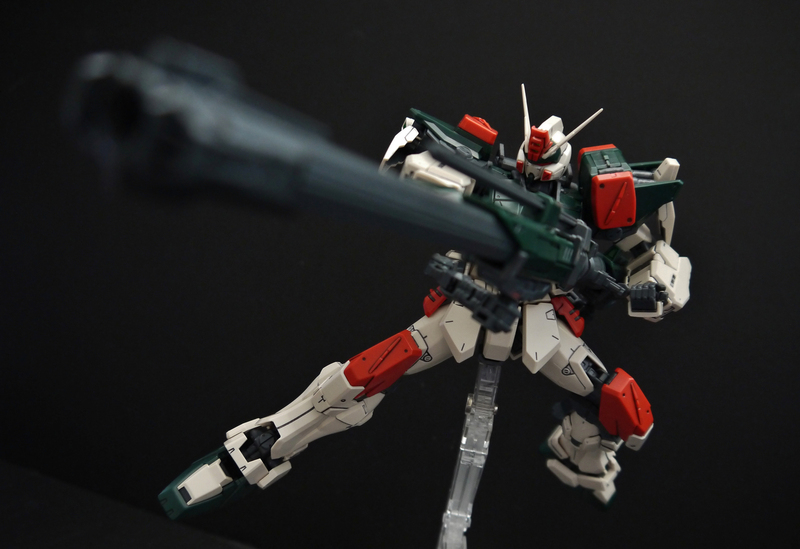 The individual cannons themselves can actually adjust their lengths in the sense that the trigger area moves up and down the shaft. This way you can adjust it so the Buster will be able to wield it efficiently no matter what. It can take a good amount of fiddling to get the Buster’s arms and hands to line up just right with the cannon handles, but the result is always well worth it. A slight quirk I have with this is that the side-skirts, which hold the hinges that connect to the cannons, fall off rather easily. They aren’t particularly tight and are bound to come off when you’re getting everything together. Sometimes the guns can stretch the limits of the hinge arms so much that the skirts pop off while it’s in position as well. Overall though, it gets what it’s supposed to do done. The extremely articulated hinge arms come in real handy when working with these things, though they can also be very restricting in some cases. All in all I gotta say, Buster is one incredible kit. I’d recommend picking it up even if you haven’t seen it in the show or know its back-story. The articulation and design itself is jaw-dropping, at least for me. I guarantee it’ll also be one of the most stable kits ever on the shelf, thanks in no small part to the impressive ankles. 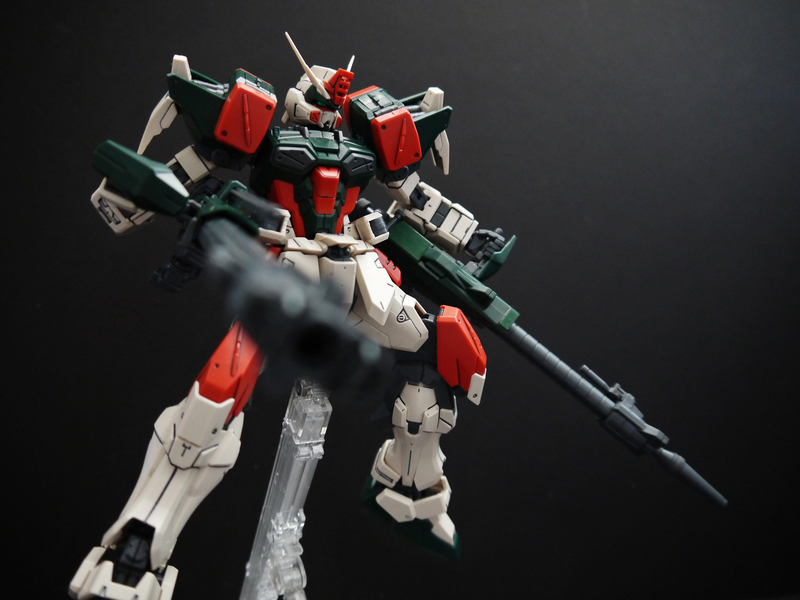 While it doesn’t sport any melee weapons (understandable; it is a long-range artillery suit, though I suppose you could always pose it bludgeoning some poor soul to death with its giant guns) or that many extra accessories, its built-in weaponry is more than enough fun. Awesome review, and great photos! 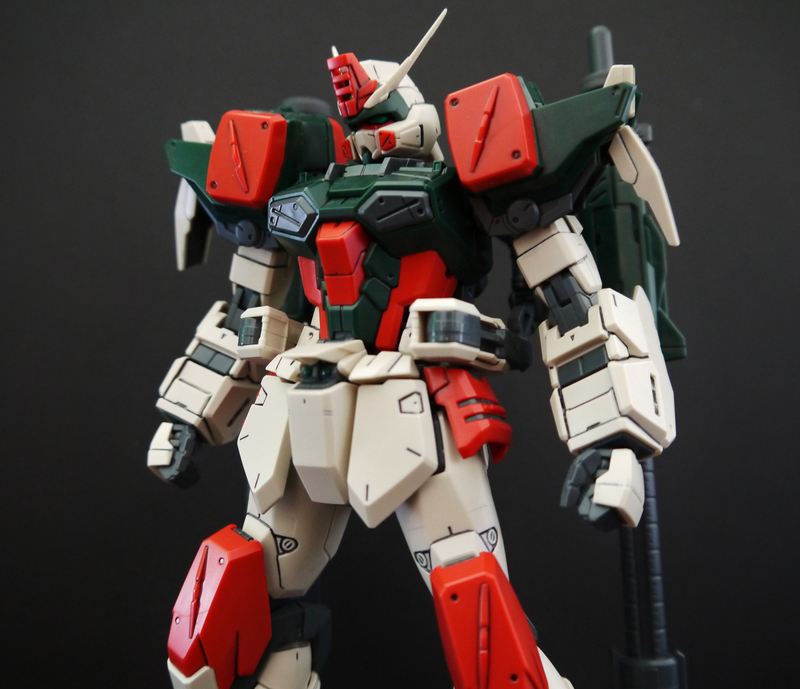 I just finished my own MG Buster Gundam and my poses and pictures are kind of meh. After seeing your work, I definitely have a lot of inspiration to improve my posing and photography. Thank you! Thanks for checking out the site, glad you like it 🙂 Practice makes perfect haha it took me a while to get to where I am now and the Buster is actually part of what I consider to be my “last gen” of photo and model works, since it was before I got my latest lighting and backdrop setup.